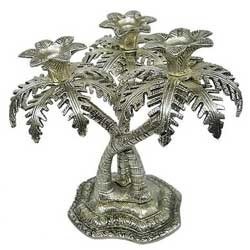 Customers can avail a fascinating range of White Metal Candle Stand in elegant designs and varied shapes. We offer products like Floor Candle Stand, White Metal Candle Stand, Antique Candle Stand and Crafted Candle Stand under this category. The offered range is made up of quality assured raw material and is highly suitable for using in homes and offices. Customers highly prefer our range for its light weight, beautiful crafting and attractive designing. 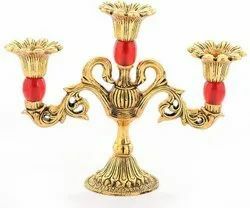 We are manufacturing Golden Plated Candle Holder and more Decorative Tablewares in fine hand carving work in Oxidized Silver and Oxidized Gold finishing. We are manufacturing Gold Plated Candle Holder and more Decorative and Religious Items in fine hand carving work in Oxidized Silver and Oxidized Gold finishing. 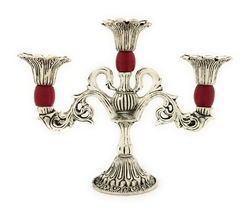 We are manufacturing White Metal Candle Votive and more Decorative Tablewares in fine hand carving work in Oxidized Silver and Oxidized Gold finishing. We have in store with us White Metal Twin Candle Stand, which creates a soothing ambience in the interiors with the elegance and beauty of the product. These are designed using high-grade material and are at par with define industry norms and standards. Our innovative and stylish advent candle holders provides an elegant touch to the interior of the home. These Decorative Advent Candle Holders are ideal for use in decoration and special occasions. 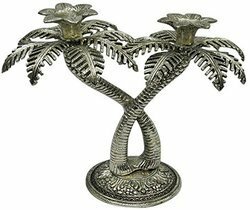 We are manufacturing White Metal Candle Holder and more Products in Different Designs in fine hand carving work in Oxidized Silver and Oxidized Gold Finishing. 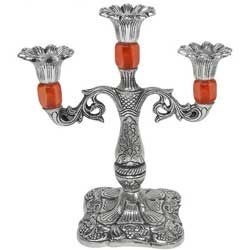 Bharat Handicrafts are a coveted firm engaged in the business of Wholesaling, Manufacturing, Supplying and Exporting a quality assured gamut of Silver Plated Cow Stand, Silver Palted Ganesha Wall Hanging, Silver Palted Ganesha Wall Hanging, Meenakari Elephant Statue, White Metal Fruit Bowl and Designer Jewelery Box. Apart from this we also offer Decorative Silver Plated Table Lamp, White Metal Ganesha Statue, White Metal Ganesha Statue, White Metal Ladies Purse, German Silver Handicraft, White Metal Jug and White Metal Fine Surahi. All our offered products are manufactured by abiding strict industrial guidelines and set quality standards at par with the specifications furnished by the customers. Owing to the optimum quality and diversified features of our range, we have established a wide client base in South / West Africa, East Europe, North Europe and South / West Europe. We are engaged in manufacturing of White Metal Camel Candle Stand with the craftsmanship of our artisans. We are having various sizes and shapes of candle stand. 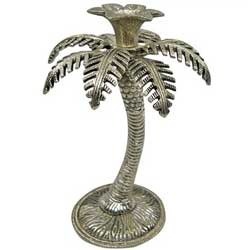 We are manufacturing a range of Metal Palm Tree Candle Holder. They are beautifully designed by perfect artisans in oxidized silver finishing. This is a 3 hole candle stand in tree shape. 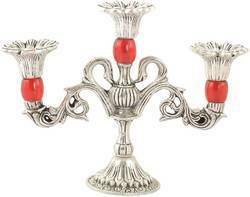 Our organization holds immense expertise in rendering a broad array of White Metal Candle Stand. These candle stands are widely demanded in the market for their excellent finish, durability, elegant designing and optimum quality. We offer this range in plethora of alluring designs in custom made sizes and lengths to satisfy the diverse needs of the clients. Our range truly reflects the artistic and innovative work of our designers and can be availed at very reasonable prices. 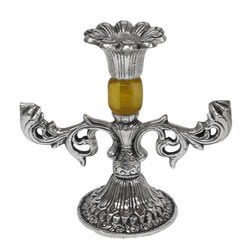 Add a touch of grace with our supreme quality German Silver Candle Stand that has been designed by our team of adroit craftsmen to offer a tranquil charm to the ambiance. These are made with the highest-grade white metal oxidized silver in our state-of-the-art manufacturing facilities by maintain rigid standards of quality. We have a wide spectrum of intricately designed candle stands that are available at reasonable prices. We are manufacturing a range of white metal candle stands. They are beautifully designed by perfect artisans in oxodize silver finishing. 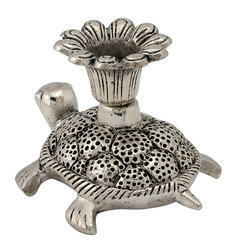 We are engaged in manufacturing Tortoise Candle Stand of white metal or silver plated. We use high quality raw material in making of candle stands and can be used anywhere, be it homes or offices. These products are available in market at most economical rates. Make those interiors gorgeous and graceful with this supreme-quality White Metal Candle Stand that can hold three candles and impart a serene radiance to the decor. We manufacture these under stringent quality and environmental safety norms by using premium-grade white metal oxidized silver. These offer rich appeal and seamless finish, and are available at reasonable rates for our valued clients. We are manufacturing a range of White Metal Decorative Casting and Carving Handicraft Items, 3 Hole Candle Stand is one of them. This is mostly used for Gifting and Decorations.